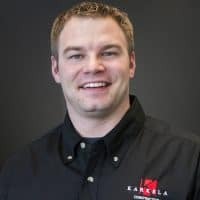 Jenny Hassenfritz, Project Manager | Karkela Construction, Inc.
Russ joined the Karkela team in 2014 and his current responsibilities includes the general oversite of the management of Karkela projects, ensuring that each gets completed on time and on budget. He graduated from MSU-Mankato with a B.S. in Construction Management. Russ has 16 years of construction industry experience. Russ grew up in Bismarck, North Dakota and now resides is Dover, MN. He is married with one child and in his spare time he enjoys hunting and fishing.